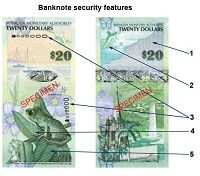 "No note is counterfeit-proof, but these notes are part of the technological advances (in anti-counterfeiting)," she said. The BMA worked with U.K. printers De La Rue Currency to come up with the features of the new note design. To ensure a smooth implementation, the BMA has consulted with financial institutions and will conduct training sessions with industry groups and schools to show how the security features work, a press statement said.